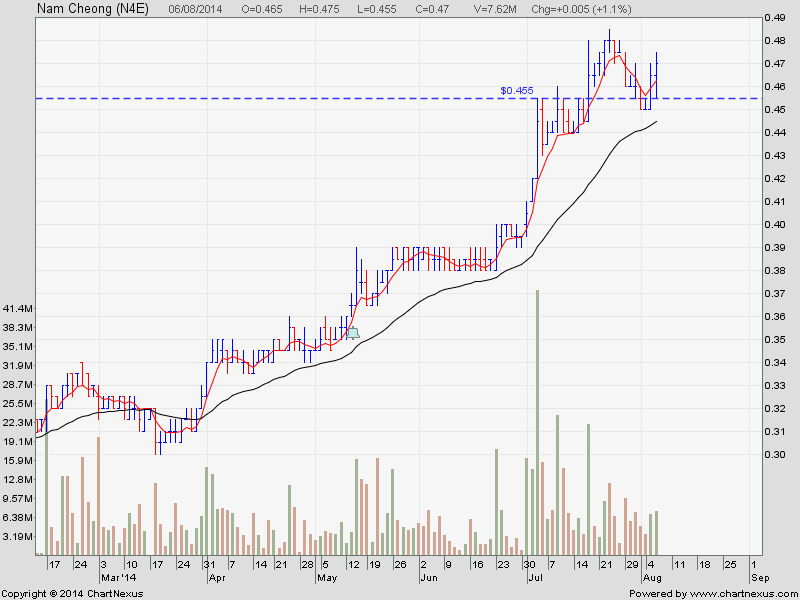 Today, Nam Cheong shoot up into the sky with huge volume. It became my second good trade of this month. I entered this trade on 7/8/14 at $0.48 as posted here. As you can see, it isn’t difficult to get 4 good trade a month to replace your income if you follow this blog closely. Everyday, I will post 2 stock call on this blog and you reader have a whole night to read and key in the order into your trading platform. 1)European Market will rebound very strong after this correction and I foresee Asia market will follow suit. 2) This few week will be very good for trading and investment because after a correction, many stock will be cheap and low risk. 3) My third good trade this month is Valuetronics entered on 7/8/14 at $0.53 as posted here. 5) My stop loss on Ezra entered on 8/8/14 as posted here was triggered. 6) Swissco entered on 8/8/14 at $1.00 as posted here would probably be my fourth good trade of this month. Nam Cheong is a very strong trendy stock. It is not affected by the recent sell down. As posted on 23/07/14, my Trading System had given me a warning that US and European market will go through a selling wave. Amazingly, today, after 2 weeks, the selling still continue. This is how GOOD my trading system is. With such a system, I can easily get 4 good trade a month for my income perpetually and trade anywhere in the world as long as there is a internet connection. If singapore living condition becomes unbearable, I can migrate anytime to another lower cost country like Thailand where I can easily own a few lands. With the correct knowledge, tool and system, you can lead any lifestyle you want anywhere, anytime. STI is still well supported by the BBs. 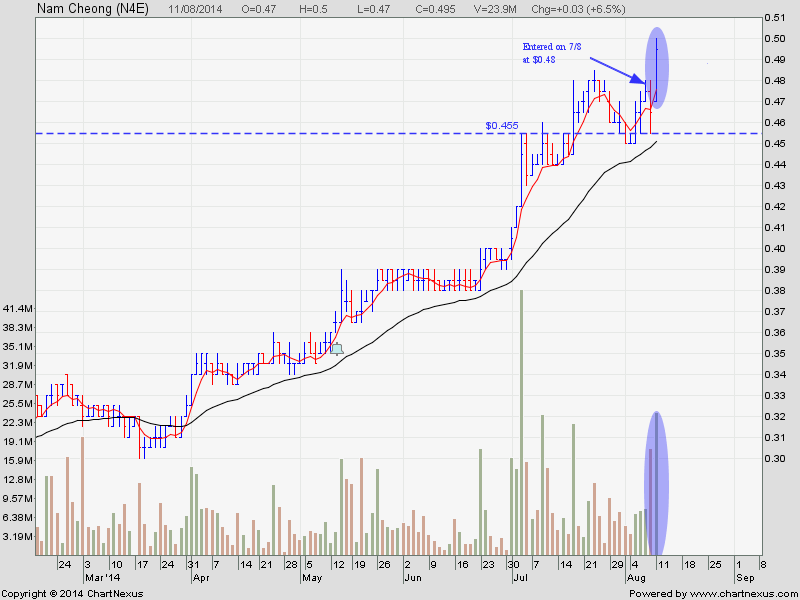 Should rebound soon. Take note of Valuetronics, UMS, Jaya and GMG as posted this week.